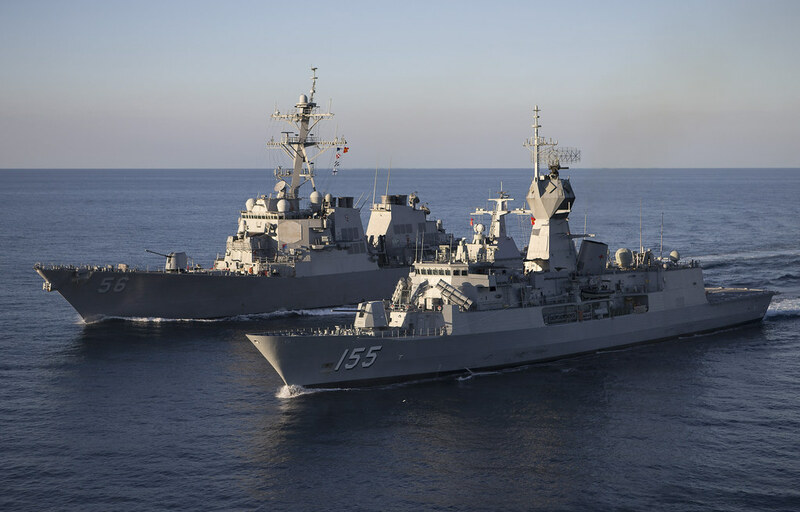 DARWIN, Australia - The guided-missile destroyer USS John S. McCain (DDG 56) participated with four Royal Australian Navy ships, the Royal Australian Air Force, and U.S. Marine Corps during Field Training Exercise - North (FTX-N) in late June. FTX-N is a precursor to exercise Talisman Saber 2017. During the FPEX, Gunner's Mate Seaman Aaron Aston had the opportunity to be part of the exercise as a gunner stationed at one of the .50 caliber machine gun stations. "It's a rare opportunity to participate in a multi-national exercise such as this," said Aston. "It was one of the most realistic events I've ever got to participate in. I really felt like the exercise helped me to be able to respond quickly in the event an actual situation would arise." "Exercise Talisman Saber is a major combined exercise, the largest of its type," said Parker. "It's an Australian-U.S. exercise that hones our skills in high-end medium intensity warfighting. It provides an excellent platform for us to be able to improve our collective readiness, our combat capability, and interoperability." Cmdr. Alfredo Sanchez, McCain's commanding officer, also hosted the Northern Territories Administrator, Chief Minister, the Mayor of Darwin, and other local government officials and military officers for a ship tour and expressed gratitude in working with the Royal Australian Navy. "The Australian-U.S. military alliance has been a model of close cooperation and trust," said Sanchez. "Australian-U.S. forces are a capable ready maritime force standing by to preserve peace and prevent conflicts in the Indo-Asia-Pacific region." Members of the crew assisted with the tour. "I was proud to show off the ship and what it can do," said Logistics Specialist 2nd Class Isaia Banaag. "For us to travel across the equator, to come here and show how expansive our area of operations is; showing that we are ready to go anywhere at any time." As the tour came to an end, the visitors and crewmembers took a moment to snap a group photo in front of the ship's 5-inch gun mount before departing to attend a luncheon aboard the HMAS Ballarat.